Project management and art happen in 2 different sides of the brain, so we weren’t surprised when we received a call on Friday asking us if we could bring a truck downtown the next morning to help install an exhibit for an art festival. 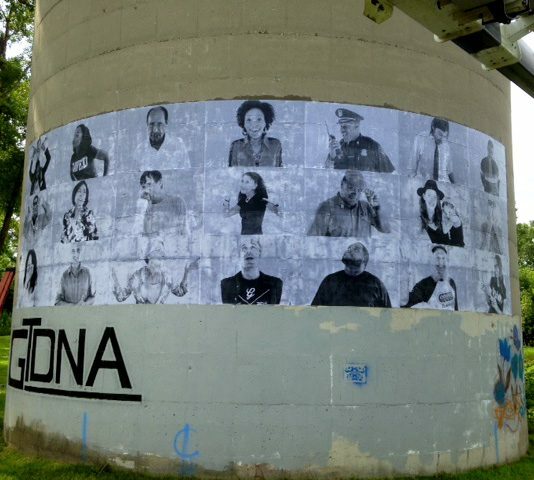 Paige Barnett, a Detroit artist (formerly of Flint) had created the Inside Out Project, large-scale photo installation which consisted of photos of 28 local people pasted on the 2nd Avenue silo in downtown Flint. The finished design is 12′ x 28′. 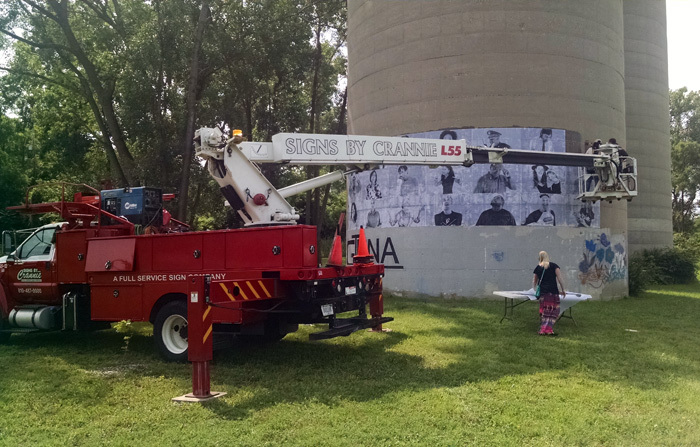 The photo installation was part of the 2015 Free City Festival held in Flint, Michigan. Fortunately, we were very familiar with the silos, having helped other artists work with them on previous projects. As it turned out, we brought a bit bigger truck than we actually needed. The very happy artist Paige and her assistant (and mom) Gloria were very appreciative of the volunteer help from Nick, Alicia and Dan from Signs by Crannie. Paige said SBC made the project possible.